Whether it's Halloween or you just have the desire to bring a little spook into your life, creating a haunted house can be as much fun to make it as it is to visit. You must create a plan before you begin any large project, and this is no exception. Choose a theme, purchase props and find helpers to create a perfectly "spooktacular" haunted house. Barn - A creaky old barn is a great place to hold a haunted house. The old wood and creaky floors will add to the authenticity of the spooky house. Basement - A basement is a great venue for a haunted house. Many basements are dark, even in the daytime because of limited windows. And best of all, you can probably use one for free. Garage - Garages are easily accessible because of their large doors which can make it easier to get large props in and out and can create an easy flow of traffic. Gym - A big open space, such as a school gym, can be the perfect spot to host a haunted house as it provides plenty of space for building and is likely to have limited windows. Living room - Even your own living room can make a good place to create a haunted house for your own children and the neighborhood kids. 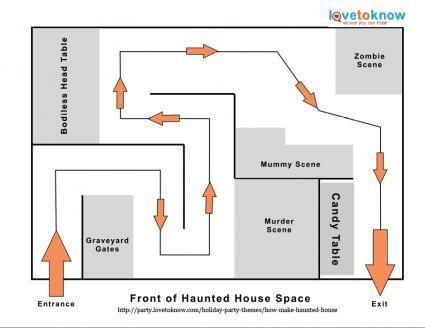 The next step in building your own haunted house, after you find a venue, is to make a floor plan and design. Follow the step-by-step guide to create your very own haunted house, printing it off using Adobe for reference as you set things up. Using the diagram keeps the foot traffic flowing and includes some very spooky elements that will make even the toughest guests jump. Maze - Most haunted houses are created with a maze style. This helps to keep the traffic flowing and allows for every visitor to get a chance to see the haunted house in its entirety. Add a few extra twists and turns to confuse your guests. Emergency exits - Be sure to include emergency exits to assure the safety of your guests. Safety lights - Even though haunted houses are meant to be dark and scary (see lighting section), for safety reasons it is wise to have low lights so guests can see where they are walking or in case of emergency. Once the floor plan has been determined, it's time to set up each individual scene. A graveyard gate is the perfect way to start your haunted house. This notoriously scary place will help to create a mysterious and spooky setting which will help the guests to get into a scary mind-set. Although you can purchase a graveyard gate, tombstones and other graveyard decorations, it is often more fun to create your own. Create or purchase a cemetery gate. The height and width of your gate will be determined by the venue in which you are building your haunted house. If you have an existing door for visitors to walk through, plan to build the arch around it and allow the opening of the gate to be the door. If you are creating a free-standing arch, a reasonable opening dimension is at least six feet high and three feet wide. This dimension should be large enough to accommodate most guests easily. Once you have decided on the dimensions of your gate, you can start creating it. It's best to lay the project down on a basement floor or a driveway so you have plenty of room to lay it out flat. Use a box knife to cut the cardboard to the appropriate size and shape. The two sides of the gate should be about 18 inches to 2 feet wide and about 6 feet high. If you don't have cardboard that is large enough, you will have to duct tape two pieces together. The header should be as wide as your two posts plus the opening. The height of the gate header should be at least 12 to 18 inches. Once you have a structure created, you can cover it with stone patterned paper or paint it to look like a stone wall. Add pictures of skulls or paint the word "Cemetery" on the top of the header. If you are attaching the gate to a doorway, use duct tape or a nail to secure it. If you are creating a free standing gate, find a way to keep it upright that works with your venue. For example, secure it to a garden arch or duct tape garden stakes or poles to the base and stake it into the ground. Add a few fake tombstones cut from foam core that has been painted to look like stone around the area. 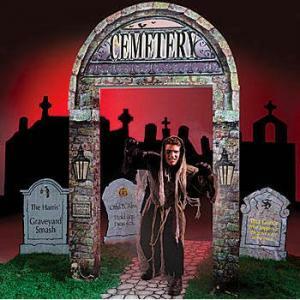 Then add a fog machine and some eerie lighting to help create a spooky, graveyard atmosphere. 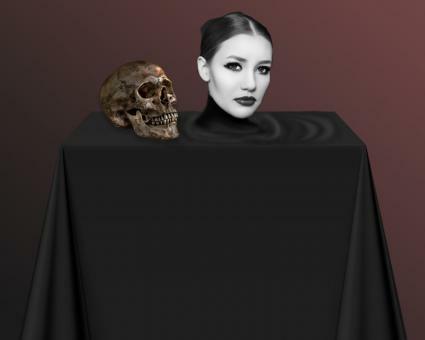 A bodiless table, otherwise known as a "talking head," is a great addition to a haunted house and is fairly simple to make. Cut a round hole on the top of the table with a jig saw. The hole should be large enough for the actor's head to go through. Drape the table in black fabric and cut a hole for the head to go through. Set the table in the haunted house and drape the walls and the table with black fabric. The actor can now sit under the table, with his or her coming out the top to give the illusion that he or she has no body. You can embellish the table with a skull or electric candle. Be sure to secure the items to the table top to make sure they don't fall off if and when the table is bumped. Nothing can bring panic into the hearts of your visitors than a realistic murder scene. Perhaps the best way to create this scene is to have an actor, with fake blood and a fake weapon jump out to startle visitors and to create a truly creepy scene. Mix the ingredients together in the quantity you will need. Set a scene with fake blood on walls and other props. Be sure to have enough lighting so that visitors can see the props, but dim enough light to lend to the eerie and mysterious scene. Spread fake blood all over the shirt, faces and hands of actors. It's also effective to have actors hide behind large items and attack visitors with fake weapons. 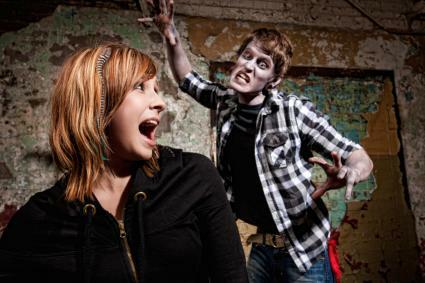 Combine the zombie and mummy areas for a truly hair raising experience and as the grand finale of your haunted house. Set the stage by spay painting bare tree branches with black paint and setting them in buckets of sand to create a scary, dark forest. Wrap the buckets in black fabric to help conceal them. Add some tombstones and lights and fog machines, and maybe some spooky sounds playing in the background. Dress your actors in costumes to resemble zombies and mummies. 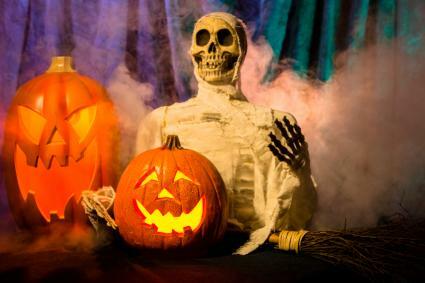 You can purchase costumes or make simple mummy outfits by wrapping actors in white gauze bandages from head to toe and adding fake blood and zombie make-up. Reward all your brave visitors with a souvenir of candy from a candy table. Provide some spooky food for your guests at a candy table. A simple bowl of candy corn can be an inexpensive and attractive treat. Fill plastic food handler's gloves with popcorn or small candies to replicate a severed hand. Serve food in plastic jack-o-lantern trick-or-treat pails. Provide some non-sweet options for guests on a limited sugar diet. Some possibilities include fruits, stickers, or small bottles of bubbles. Create food labels with clever, scary or gross titles such as labeling a bowl of marshmallows as "spider eggs" or any other type of food as "poison." A theme can help guide you in your endeavor to create a haunted house and can unify the entire project, if you want to create a unified experience. Movie theme - Use your favorite horror movie as a theme for your haunted house. Friday the Thirteenth is a popular horror movie that can be used as an inspiration for a haunted house. Popular story - Books with a scary theme, such as The Legend of Sleepy Hollow, can make a suitable theme for a haunted house. Specific characters - Choose a specific type of character such as aliens, vampires or scary clowns as a theme. Insane asylums - Many spooky characters reside in insane asylums which makes this a great theme for a haunted house. Pirates - Skeletons and ghosts are prevalent on pirate ships and can make the perfect background for a spooky theme house. Graveyards - What could be spookier than being lead into a graveyard in the dark which is why a graveyard theme is perfect for a haunted house. Real haunted houses - Research real haunted houses and model yours after your favorite. Legends - Create a haunted house based upon the ideas of alien abductions and other scary urban legends. Haunted houses, even the kind that are built in your own basement, can be scary, especially for young children. Be sure to keep the ages of your audience in mind when designing your scary house. Add more lights so children can see where they are going. Have actors dress as friendly ghosts and black cats instead of insane murderers and zombies. Don't allow the actors to pretend to attack the children, but simply to startle them with a "boo". Put an age restriction on your haunted house and insist that all children under a certain age are accompanied by an adult. No matter what your theme or the age range of your audience, be sure to keep safety as your first priority. Don't serve foods with peanuts or other common allergens, have volunteers or workers with flashlights and cell phones handy in case of emergency, and be sure to be prepared for all logical or possible emergencies.